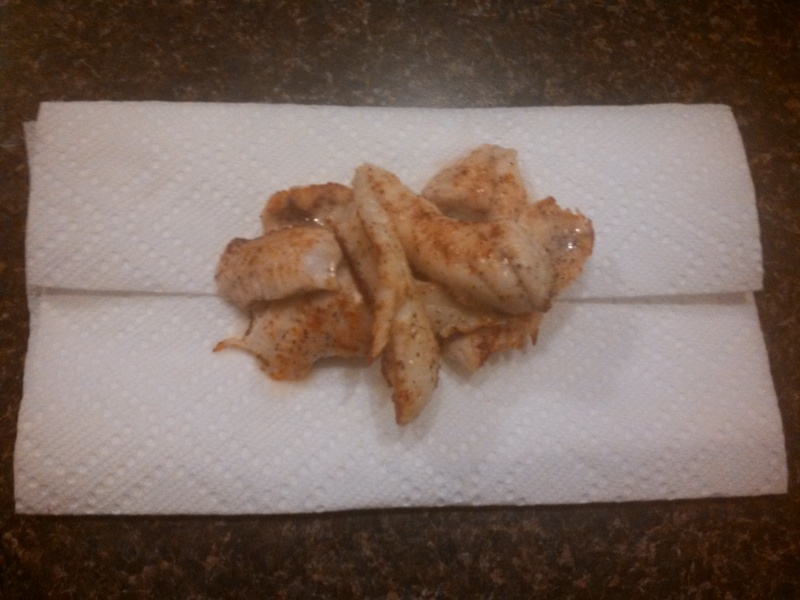 2-5-13 – Where Are The Fish? 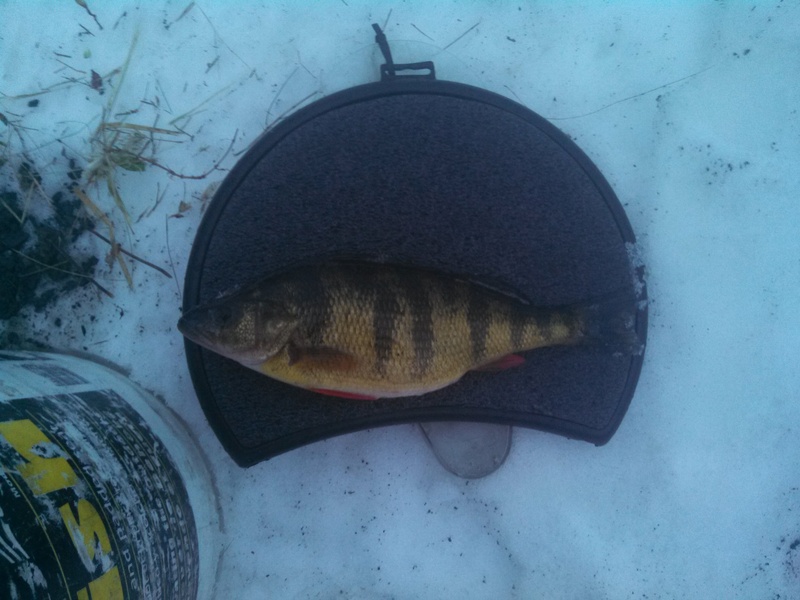 I started off the day fishing with a buddy for perch with tip ups. We weren’t there early by any means but certainly early enough for perch! We skipped fishing Lake Champlain because they were predicting sub zero temperatures and there aren’t many days there that aren’t windy. Arriving at the lake, it was -12 degrees with no wind and blue skies. We set out our spread of tip ups over a very large area with the intentions of concentrating them as we found active fish. Many of the holes that we were fishing had fish rise up as we lowered our bait down. The unfortunate part was that the fish weren’t feeding. By the time we packed up around 11am we had only had two flags. One flag was a drop and the other peeled a bit of line before dropping the bait. I pulled it in, checked that the bait was still alive and started lowering it back down. As the bait dropped, about half way down, slack started to build. I started lifting the bait only to set the hook on the only fish we caught on a tip up all day. It was a 22″ pike. 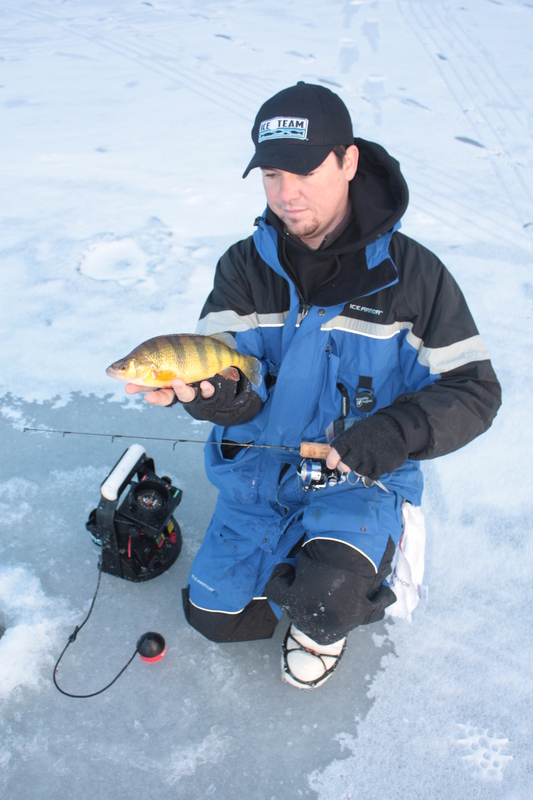 Other than that, only a few small perch were jigged up before we left. On the way back towards Lake Champlain, we made a few calls to see if the fish were active anywhere. The reports were dismal but it was a nice day to be on the ice nonetheless. We settled on a spot that has been slow all winter but at least had a few fish. We checked a few spots before settling in for the night bite. The fish were in there, thin at best. I looked in quite a few holes before even seeing a fish. After punching a new set of holes, I found a few flatfish in one of the last holes in the string. By the time I grabbed my rod the fish had mostly moved on. The bite throughout the entire day was not what we had hoped for. Luckily, for about 40 minutes leading up until we left the bite was decent. I had two holes that were productive and I kept going back and forth between them giving them a break and to replenish. 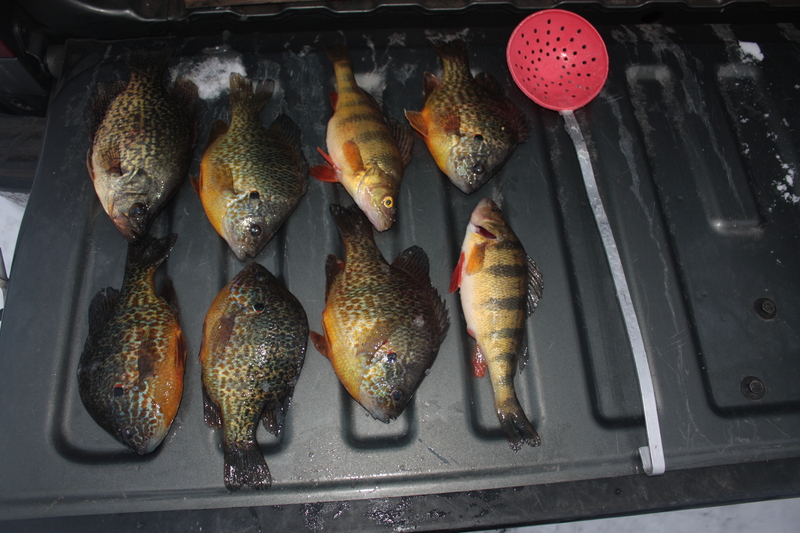 The pumpkinseed in there were on average a good size while the bluegill were rather small. The fish that were in there were aggressive. For the holes I was fishing, I would drop down to just above the weeds that came up about 3 feet off the bottom. I would start jigging there and unless a fish came right up, I would drop down into the weeds about a foot until I could see a fish start working up to my jig. I would then raise my bait up above the weeds and the fish would charge. The title sums it up. The goal of the day was to put some meat in the freezer and it was a success. I went out with a friend from work that has been using my spare Vexilar for a while now. He mainly fishes for trout so this was a change of pace for him. We hit the road late this morning after sleeping in until close to 6. We were in no hurry to get after the fish figuring that they bite all day! After making the long drive to the our destination, we unpacked and started blowing across the lake! The wind was whipping and as it turned out the fish weren’t biting very well. We punched a ton of holes over a large area that the fish usually move through. We covered various points, turns, and depths. After freeing our butts off until noon we called it morning. We were able to catch some fish but only had a few in the bucket when we packed up. As we cruised to the next spot, we “cooked” our food on the defroster making the day a whole lot better! The second spot only sweetened the pot for us! I took the auger and made a grid like pattern over as big of an area as I could without infringing on any one else in the area. As we started working through the holes, the bite took off slow. Once we hit the start (or end) of the school it of crappie was on. The fish were not moving fast and the were super active. When the whole auto zoom on the Vexilar is lit up you know you are in a good spot. We were both pulling slab crappie and perch as quick as we could get out jigs down. We were both running red tungsten with white plastics and the key to our success was a maggot to top it all off. 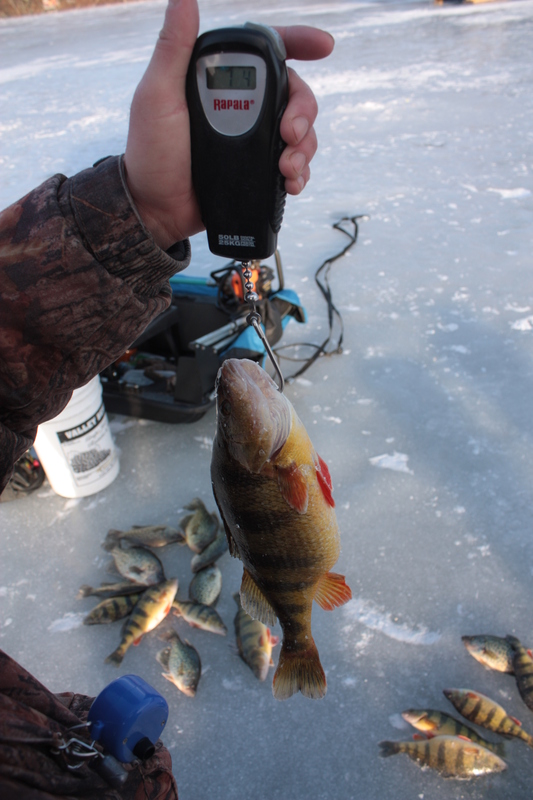 The majority of what we were keeping was perch as we were trying to throw back the big and small crappie, only keeping the good eating size ranging from 9-10″. The end of the day arrived when we realized that we had some serious cleaning to do around 4 pm. I had a kept 29 fish at the second spot and 38 total on the day. Looks like some good eating in the near future! With the tournament in the past, we had our options open for what to do. We contemplated walleye, pike, trout, and the usual, panfish. What do you suppose we chose? Panfish… We don’t get the opportunity to fish together two days in a row that often and we had some new spot to try out. As we drove down the road to where we intended to go, we opted to take a pit stop at a community hole that has been on lately. 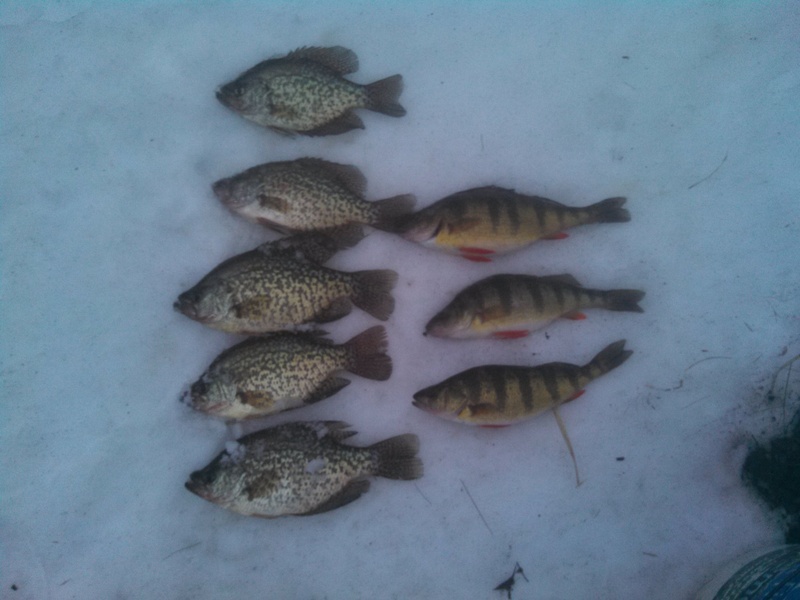 We fished around for a while and caught some fish but after a little over an hour had had enough.The crappie were not bunched up and the big perch were few and far in between. To top off the slow fishing, There were lots of people around making all sorts of noise. Packing up the truck we hit the road to the next spot. The next spot took some time to get into. We had to drive, walk, and search for fish. 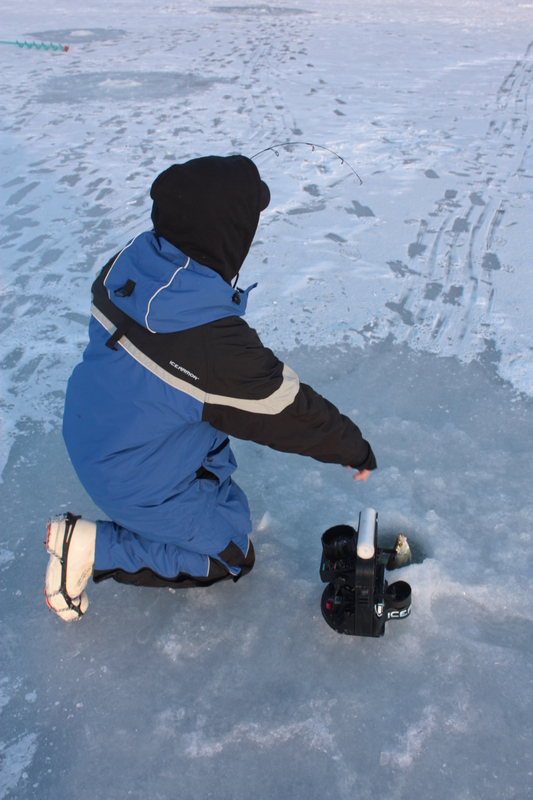 After finding enough water to hold the flat fish we were after, it didn’t take long for us to start bring the fish above the ice. 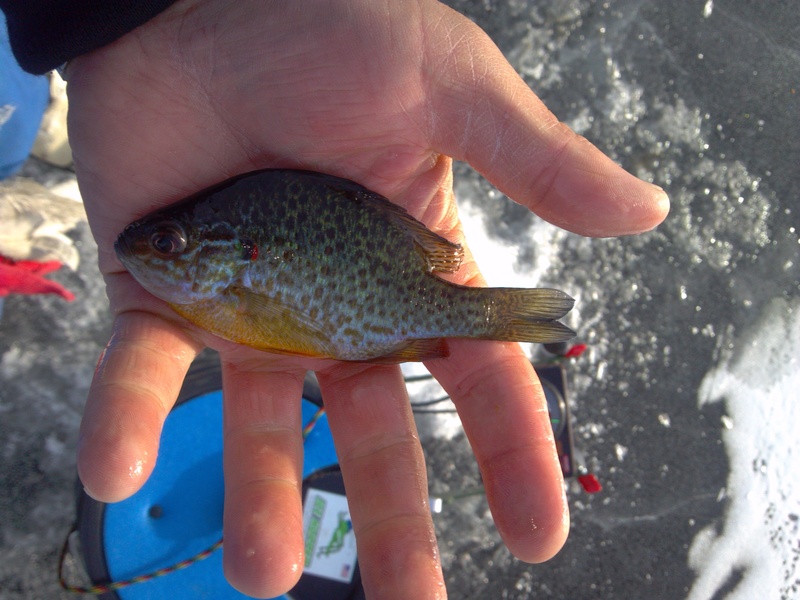 With a depth reaching slightly over 10 feet, the crappie, bluegill, and pumpkinseed were being caught all the way up to just four feet below the ice. The size on average wasn’t great but we saw three different age classes of crappie. Using an underwater camera, we found that the weeds were thin and the bottom was all sand. A few bass were cruising through the area but were not active. After being content with what we had found, we packed up the truck again and headed out. The next spot we wanted to fish was not a go. The ice looked sketchy at best with open water randomly and varying shades of ice color. We didn’t even bother going out to check it and headed back to where we started the day. To wrap up the day, we kicked open the holes from the morning and worked through them. The bite was slow and we decided to make a big move to another sweet spot on the body of water. Bobby punched the holes and I followed looking for fish with the camera. The first few holes were barren but as we got up into green weeds the fish started to appear. Crappie, bluegill, and perch were common for the rest of the day although hard to catch. We fished until it was close to dark but called it a day just after the sun set. The temperature was dropping fast and the bite wasn’t worth getting too cold. Good day overall on the water and it is always nice to expand our fishing locations! 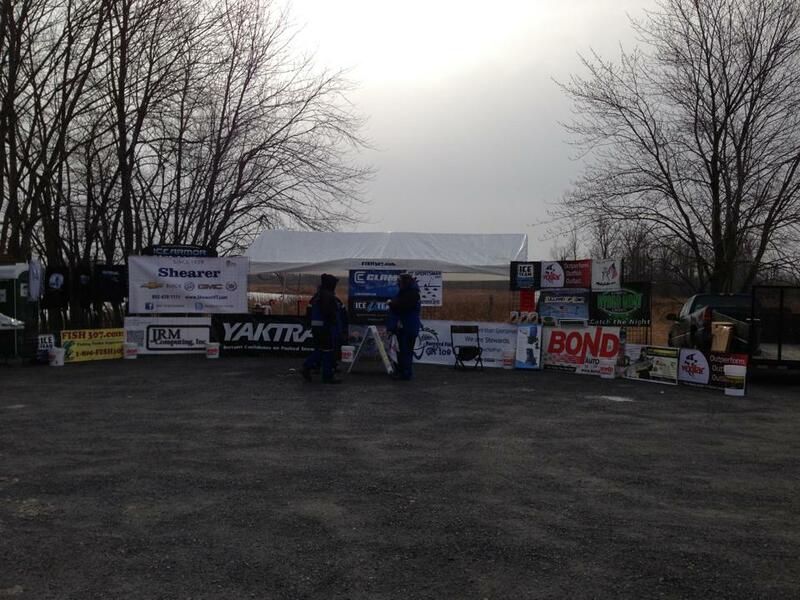 The second stop to the Vermont Sportsman Hardwater Tournament Series was scheduled to be on Laphams Bay on southern Lake Champlain. When over an inch of rain fell and warm weather melted all the snow then ran into the big lake just a few days before the event, the southern end of the lake turned to mud. 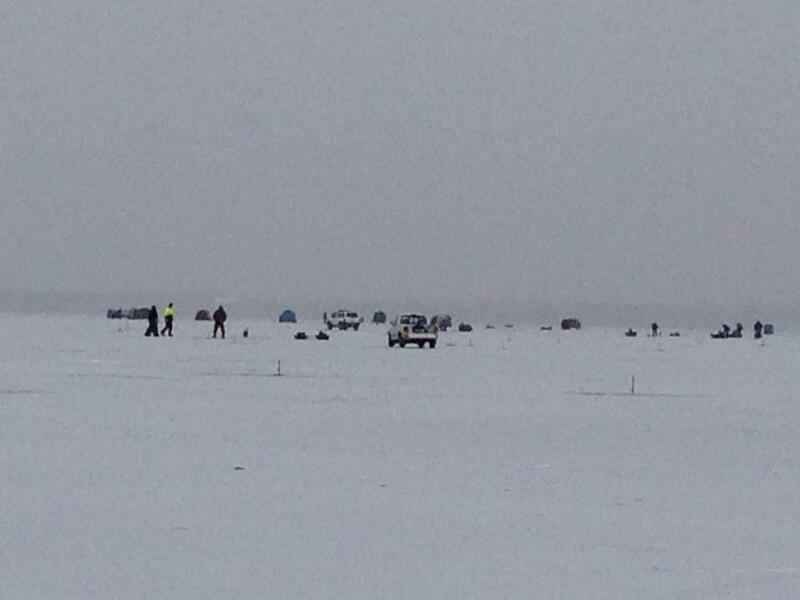 The event was rerouted to be on Dillenbeck Bay on the northern end to give anglers a better chance at catching fish. The day of the event was on a nice day. The winds were fairly calm for the area and the sun was shinning until just after noon. The bite on the other hand was tough. Fishing from 6:30 am until just before 2 pm, the number of fish that came through the ice was slim. Not very many fish, other than perch, were released. 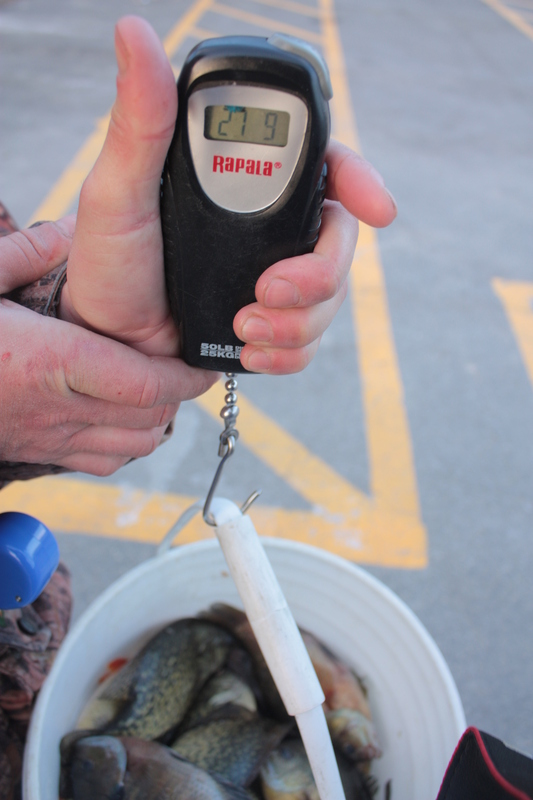 Overall, only 14 crappie and 110 pumpkinseed/bluegill were weighed in at the end of the day. The bite was tough for this part of the lake. Bobby finished off the day in 5th place with a weight of 2.13 pounds. 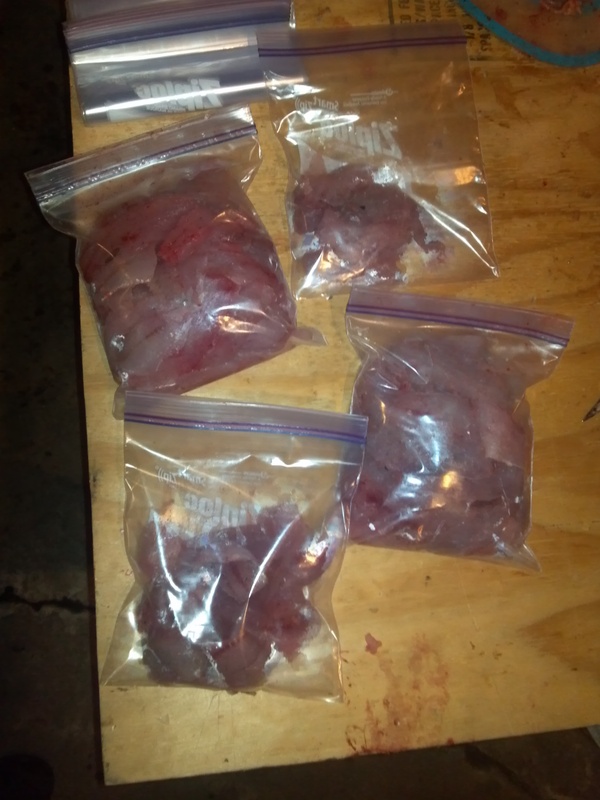 The bag was composed of 3 pumpkinseed and one crappie. Dylan had a final weight of 1.80 pounds composed of just 3 pumpkinseed, finishing in 17th. 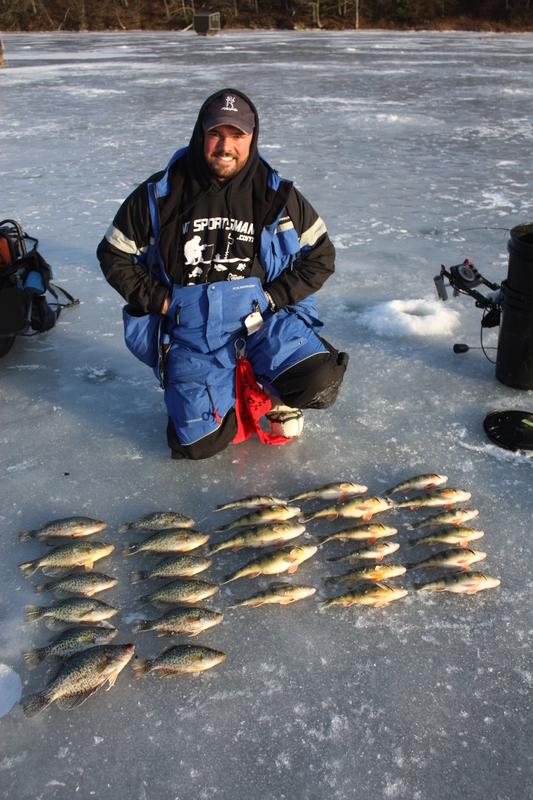 The weights of the entire field were relatively close because crappie were not much of a factor. My day started a little earlier than Bobby’s. I was on the road by 5am but not for long. I made it about a mile before deciding that the roads were too treacherous for me to risk making it to the lake in search of trout with tip ups. Instead, I returned to bed where I stayed until a little after 8. Lounging around the house, I felt guilty not being on the ice knowing that the road crews had been out for at least a few hours now. A little after 9, Bobby called me telling me that he was heading out fishing as school was cancelled. I was at that moment compelled to get out myself. Being that my truck was loaded I headed to a nearby pond to fish for perch. With only a few hours until work began, I felt confident that I would be able to get at least a few. After punching a number of holes, I started fishing. The location I was in offers water mainly deeper than 8 feet with a good population of perch that at times can be very tricky to locate. I worked a 10-14′ contour that parallels the shoreline. After about 15 minutes of actionless fishing, my first mark came across the screen about 3′ off the bottom. 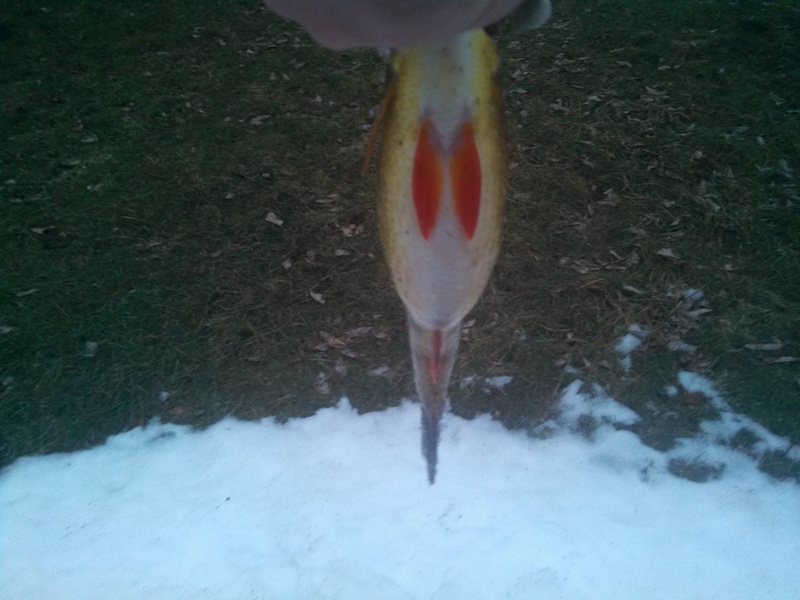 At first I thought it would be a pickerel because that is how they move throughout this lake but boy was I wrong! Quickly raising my jig up, the fish smacked it and the fish was on. It took about 2 cranks on my reel for the fish to rise to the bottom of my 6″ hole. After a few twists before getting its head pointed in the right direction, I realized that it was a rainbow trout! I have never caught a trout in this pond even in the summer months when they feed heavily. Over the next 20 minutes I hooked up three more trout but only landed two of them. It was pretty cool to catch these fish being that they are rare at best. The area I was targeting is rather featureless besides one large rock. I fished all around it but only found them on the shallower side. 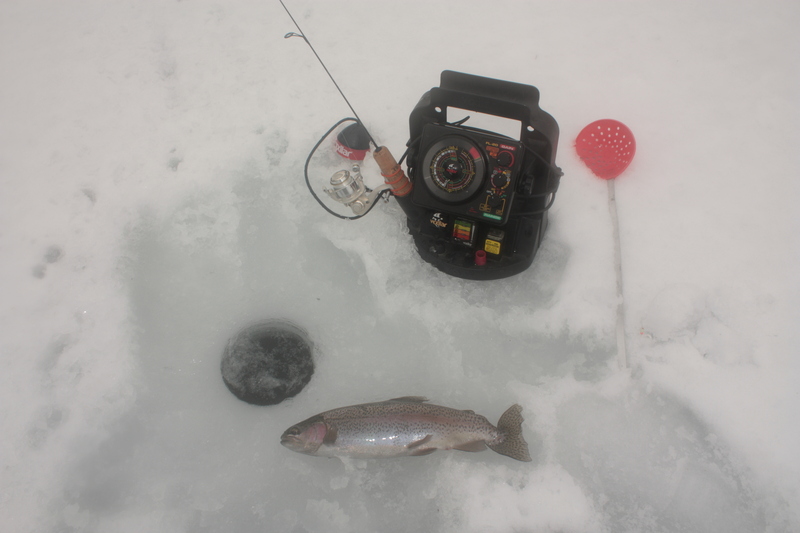 I never switched my bait throughout the two hours I was on the ice. I ran a a white stinger by Bentley Fishing USA and a white Jamei by Maki Plastics. I hooked every fish that came through to look at my jig and only lost one of the biters. 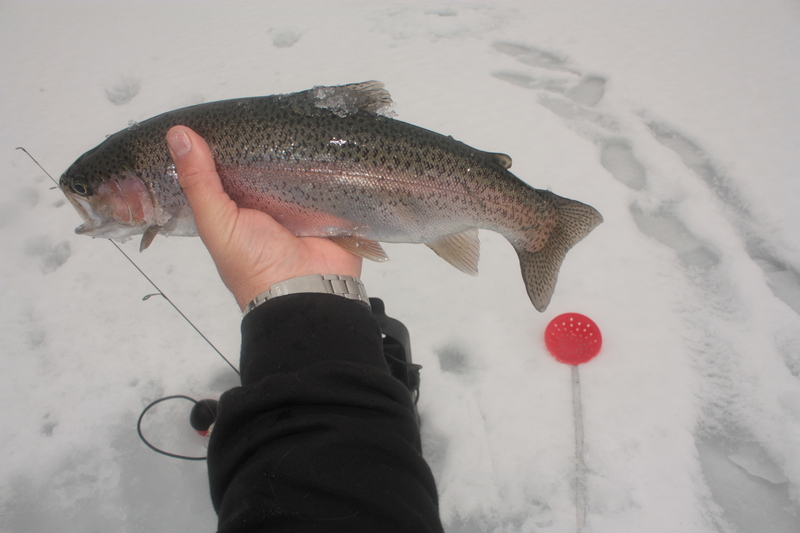 Check out Three Rainbow On A Short Trip on our YouTube page for more action! I had to stay at work Monday night so Tuesday morning I didn’t get on the road till around 8. This was my first trip to fish Champlain since the Vermont Sportsman Hardwater Tournament Series event at the beginning of the month. The bite in general has been less than spectacular so I have devoted most of my time this winter to more local areas. When I hit the ice, a bunch of guys were already out there spread over a large area. The fishing was pretty slow all morning and most people only had a few fish in their buckets. The day before the bite was steady and picked up a few times throughout the day. I was hoping that there would be a mid day rush or at least an evening bite! I started off my day looking around with my underwater camera only to find that one of the dozen or so holes I checked held fish. I grabbed my rod and dropped down and caught a pumpkinseed. Second drop, I lost another. After that I went a while before getting another bite. Even looking around with my camera I couldn’t find any fish in the area. With lots of moving we found a either a pod that was moving in a small area or corridor. From about 1 pm till I left at 4 the fishing was steady. About 90% of what I caught was pumpkinseed. The other 10% was bluegill, perch, and one pickerel. The fish weren’t picky as long as you weren’t offering them a bare hook. I used maggots for a good portion of the day but switched to plastics once the bite was on. 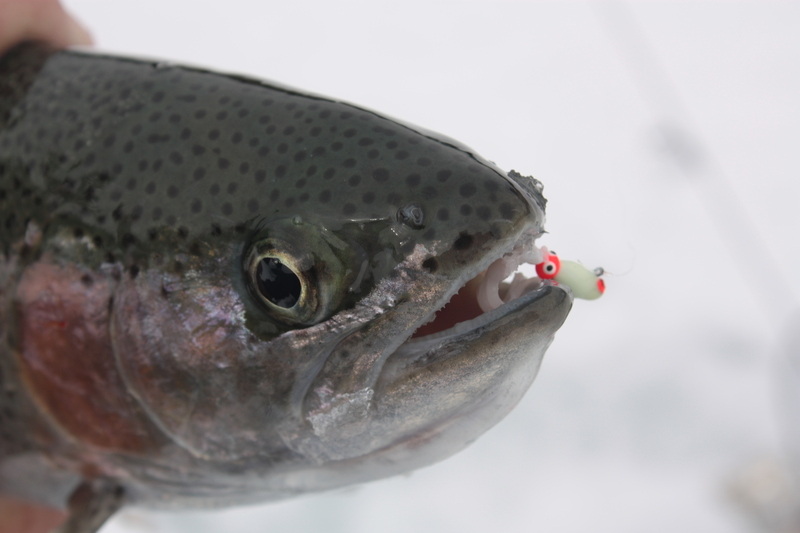 Because of the durability of plastics, I was able to stay in the water longer by spending a lot less time re-baiting.